After the veritable cable-fest of the last month or so, it was time to give my wrists a break. As an aside, I seem to gravitate towards things that are hard on my poor wrists. Piano, 15-ish years of serious study; violin, 10-ish years of serious study; programming/web design, almost 10 years; and now knitting for two years. I should probably go see someone about my wrist pain, as I’m not exactly sure what the problem is. The pain tends to radiate across the back of my hand and occasionally I wake up with numb pinky fingers—not symptoms of carpal tunnel, I don’t think. I also have weird issues with my elbows. But enough about me and the fact that I’m 25-going-on-86 and falling apart in places. This is the Red Herring Scarf you see in my sidebar. It’s essentially glorified stockinette, using the Herringbone stitch pattern from Vogue Knitting and a little moss stitch border. I’ve also been working on my knitting penance. Big, fat needles, only knit stitches. It’s good, mindless knitting. And look, now there’s yellow! I almost feel like I should start a pool to see when people think I’m going to finish this thing. I started working on it in January 2005, I think. It is currently close to two-thirds done. Any guesses? 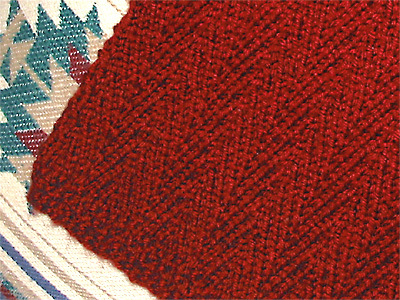 CogKnition posted this on December 17th, 2006 @ 3:54pm in Unfinished Objects | Permalink to "A Little Light Knitting"
Oooh, that herringbone stitch is very pretty! 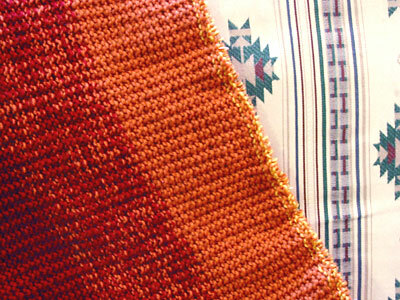 Based on your past rate of speed, I predict that the penance blanket should be done by New Year’s 2008! And take care of your hands/wrists! It could well be the area right around the bump where your neck meets your shoulders. (It was with me.) Same symptoms – numb outsides of hands, pain across back of hands. Try a Palmer-educated chiropractor…or some heat therapy. 10 minutes, then rest it for 10 minutes. Might help! By the way, I avoid shoulder and wrist pain by constantly changing the craft. Changing from knitting to crochet to embroidery or whatever else I’m doing seems to prevent it.